Happy Sunday! It’s been a lovely weekend for us, thus far. My mom came to visit, so hubby and I got to go out on a date last night! It was quite nice to just go and relax… Had some yummy seafood, then a few cocktails and dessert… My idea of a good time with my cute redhead! Today’s Christmas in July post is very technique-y. I love the magical, nebulous look of bokeh, as I’m sure you’ve noticed, and I thought what is more magical than the idea of a reindeer that can fly?? I started with a panel of watercolor paper and blended several shades of blue on it: TH distress inks in chipped sapphire and tumbled glass, then some SSS island blue for my medium shade. I then took my bokeh dots set from Ellen Hutson and stamped various size dots, some stamped off once, in the same ink shades. 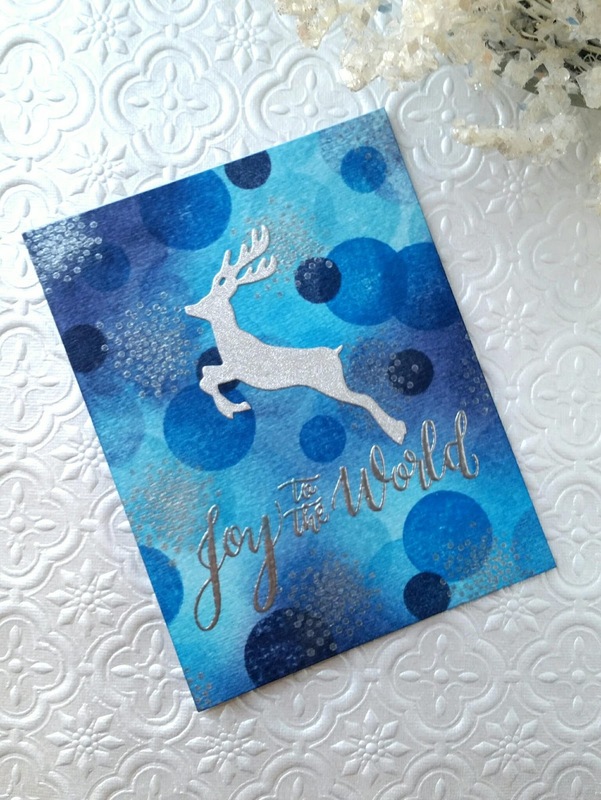 I stamped one of the “burst” stamps from the EH set in Delicata Silver ink, then pounced some Perfect Pearls to add even more shimmer and sparkle. 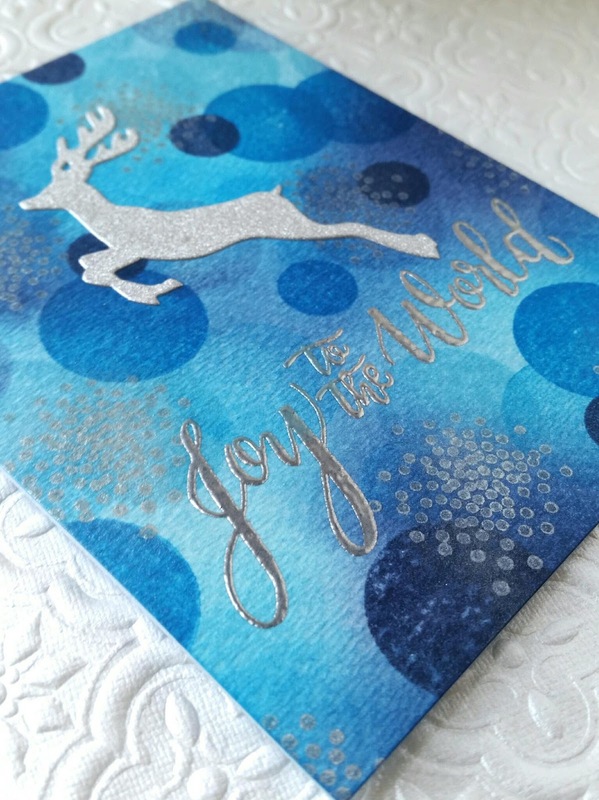 I double heat embossed the sentiment from Mama Elephant in super fine silver embossing powder, then added the reindeer die cut (a wplus9 die) cut with silver glitz paper from dcwv. A very easily mailed one layer card, but definitely a lot going on here! 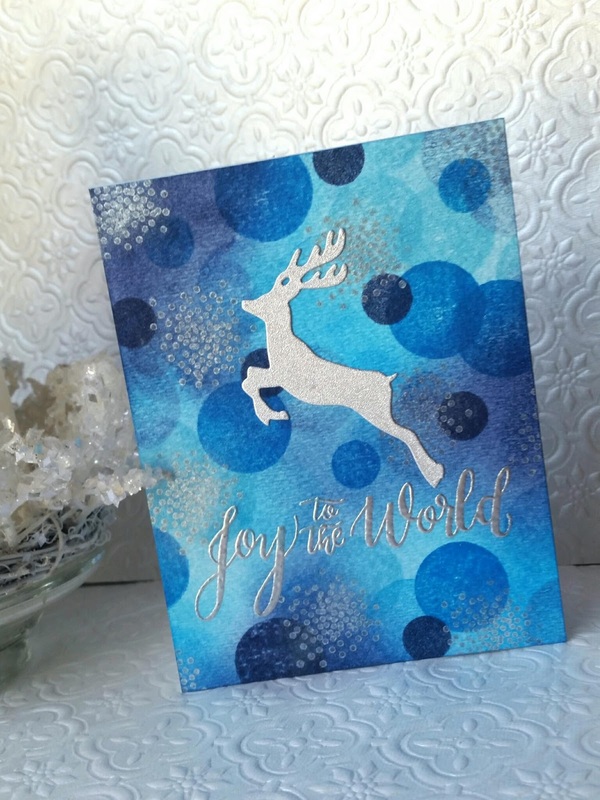 I hope you all are enjoying these posts, even if they aren’t really seasonal… I’m loving having a jump on my Christmas cards! I’m thinking I will attempt to keep making one card a week, that way I’m not overwhelmed come November. Back tomorrow with a flat shaker card! !